Our 5th weekend open at the Clipper has just passed and we have had a wonderful range of food offers. 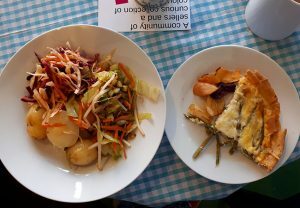 We started with lovely Lizzy trying out her Clean Food Cafe over a few days with fresh salads and quiches filling our plates. Michal who runs Our Soup at Union Corner has provided us with a mezze delight, curry soup and a veggie chilli for lunch. Then Jayne from Whimsical Wanderings tried out one of her heart warming feasts, the halloumi pepper bake being a highlight of my own. 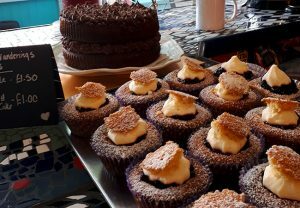 Jayne is also becoming our go to for yummy cakes to sell at the bar. Everyone has been providing affordable lunch at £2.50-£5 prices and this Friday (24th Aug) whimsical Wanderings will be at the Clipper from 12-6 pm with a Curry Pop – Up so why not come on down? Our very own Wendy even concocted her own Happy Hart Cafe for a weekend, the menu filled with thai green curry, singapore noodles, bento boxes and Wendy’s wonderful personality. She also tried out pay as you feel/can afford, with customers paying more than what we previously charged. Stay up to date with what’s on through our social media Facebook, Twitter and Instagram. The Clipper’s bar area is available to rent to test cafe ideas, with support from Nudge you can get your idea of the ground. The idea is that we grow a community of people that share experience and skills and contribute to making a really special space that people enjoy visiting. There are units available from £7.50 per day for people to sell things from. Initially the space is open Thursday to Saturday 12-6pm, people are welcome to just wander through and check it all out. The space is available to hire outside of these times. There are still volunteers and builders working away at the beginning of the week so you will see more and more improvements over the summer. Get in touch with laura@nudge.community if your interested in a space. You can also buy a share in the Clipper. If you have ever said that something needs to be done about Union Street, now is your chance to help!